I bought some of their stuff at Stitches West and fell in love. Now I want you to have some, too! 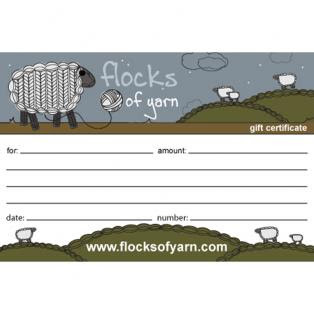 Fellow knitblogger Clumsy Knitter recently opened this adorable online shop. Now, I don't often call online shops of any sort "adorable", but this one, with its great design and fun customer rewards program, has a much more personal feel than you usually find while shopping on the internets. Great stock of yarn and books, too. 3. & 4. Goodie bags from me! Contents TBD based on the likes and dislikes of the winners, but they are guaranteed to include goodies both edible and knittable. I'll also include the winners' choice of one of my patterns. P.S. I just realized that this is also my 200th post - it's a day for milestones! Congratulations on your blogiversary! Thanks for sharing your knitting with us! Congrats!!! I am having such fun knitting Lilas. I should probably be doing other things but they can all wait. Congratulations to one of my favorite blogs and bloggers :) I am so proud to say "I knew you when..." P.S. My mom wanted me to tell you that you are a strikingly beautiful woman inside and out (and I told her, "I know.") P.P.S Happy Mother's Day to Stewart's Mommy! happy blogiversary! so glad to have met you here in blogland, and then again in real life! here's to many more years of blogging, knitting, designing, etc. (spinning?!) xo from me and boh. Congrats on the blogoversary! I've really enjoyed you're posts and I can't wait to read more. Hurrah! Congratulations! I can't wait to knit Lilas. Hooray for 3 great years! I always enjoy your posts, patterns, and snippets of Latin and Greek. I became a big fan of yours after seeing your Citron pattern on Knitty and can't wait to start on Lilas as soon as I receive my yarn order. I'm slowly making my way through your blog and am really enjoying it and am so amazed with your productivity and creativity. Here's to many, many more years! Congrats! Love your beautiful patterns. Congratulations on your blog-iversary AND your 200th post! Your blog is great, and your patterns are lovely :) Thanks for all your hard work! Happy 3rd anniversary and 200th post. Congratulations and well done. Congratulations! I'm a relative newcomer to your blog but I love the patterns I've seen. Congratulations on your day of milestones! I recently found your blog and have been enjoying it. Love your patterns - very classy. Hi, I too am a newcomer to your blog and this is my first comment. Congratulations on your anniversaries. I have several of your patterns on my "must knit" list. I've been reading your blog for a few years now...but still not the entire time you've been a blogger! I have 4 categories for "knitting and crocheting blogs I follow. 1 - first are the blogs I make sure I stay on top of every day. 2 - second category is the group I try to stay on top of at least once a week and it goes on from there. You're in my first grouping and you always have been! Congratulations! I have always enjoyed your blog, & have found many inspiring pieces that you have done. Keep up the fantastic work! Hi! I only discovered your blog last month but since I did, I've been hooked. Three years - very impressive. Congratulations! congrats on your 3rd blogiversary! I've been lurking for awhile now; I love your Lilas & Cloudy Sunday patterns...can't wait to see what else you come up with! Congrats! I love your beautiful blog and your wonderful patterns. You are such an inspiration. Thanks! Happy anniversary and hello from Wales! I've followed your blog for some time, but never commented. It's because it's true..Here's hoping for many more years, patterns,yarn and happiness to come. Hi! I started following your blog when Citron was published in Knitty. I love your patterns and your blog :) Congrats on the milestones! Congrats on three years and some very lovely patterns! Means a lot to me since I'm not the best writer in the world!! Thanks for having an awesome blog and knitting/designing wonderful patterns! Hi Hilary! I adore your blog and designs... yet, I've never posted a comment. One of your friends (from high school? Cathleen Kiilgallen) directed me to your site a few years ago and I've been reading it since. Congrats on 3 years and 200 posts! Congrats on 3 years, and 200 posts! I stumbled across your blog a number of months ago, and it's been wonderful to explore different knitting things through another pair of eyes/needles. Thanks very much, and congratulations again! Woo Hoo! I'm very happy to call you one of my blog buddies -- someday we'll catch up in SF for a burrito and a drink! A relative newbie to your blog and am really enjoying it. Thank you for posting! And congratulations. Congratulations! I've only been reading a few months, but I thoroughly enjoy your blog, and you have designed some lovely patterns. Cheers! Congratulations on so many milestones! I don't comment much, but I've been reading your blog for quite a while, and it's always a joy. Congratulations on your blog-o-versary!! I can't believe how many patterns you've created, and so many wonderful FOs in that time. I love reading your blog, and always look forward to your new projects and new designs! Happy blogiversary! I love your patterns and can't wait for more. All the best in year 4! Nice blog - nice patterns (my citron is keeping my neck warm at my desk at work right now - seriously!) - thanks for the chance to win goodies! Congratulations on making it to three years! I can't imagine posting regularly for that long! I just discovered your blog recently via your beautiful Citron pattern - love it! You have a great color sense, too, which attracts me to your patterns even more. you're a real inspiration, h. your designs are amazing, and i'm so happy for you with your recent publishing. Wow what a fun giveaway - I love your blog! I'm a lurker on your blog, and I love your designs so much. Very inspirational! Happy blogiversary! Happy blog-birthday and 200 posts. I love milestones. Congrats! Congrats on your milestones and blogiversary! I've enjoyed reading your blog since I stumbled across it. Keep up the great work! I discovered your blog not too long ago after falling in love with one of your patterns on Ravelry. Since, a few of them have been added to my queue. Such lovely designs! You do fantastic work! 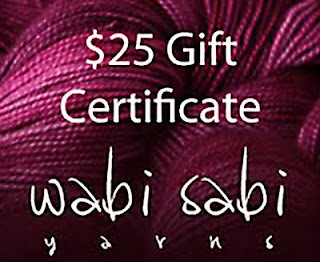 Congrats on your blog-iversary and two thumbs up on discovering Wabi Sabi yarn! Such yumminess! Congrats on your blogiversary! And thanks for the recommendation to your friend's new yarn site, it's pretty nice! Congratulations on the Blogiversary! It's always a great day when I see that you've updated, and I always look forward to seeing your new projects. Starting on my very own Cloudy Sunday currently. Congratulations-- I've been loving your blog since I was introduced to it. Your designs are great too, plus I'm grateful for your tips on The Forest Darkness (on my queue for someday). Maybe we'll meet up at Stitches West one of these years! Congratulations on three years! I just recently found your blog, but I love your patterns, and your posts. Congratulations! I have loved all of your designs. I was introduced to the bblog when I saw your pattern for the cat sweater. Congratulations on this blog and your wonderful designs! It's really we who appreciate YOU and that you take the time and effort to share your self and your talents on this forum. So thank you! Congrats! Thanks for posting so often, I love your blog! Congratulations! I always enjoy your blog - here's to many more years! Congrats! I'm new to your blog but am looking for to all of the knitting inspiration that will be coming my way. Congratulations on a a great blog. I found you when I discovered one of your patterns. I recently did a Citron and now am engrossed in Lilas! Several more in my queue. Thank you! Congratulations on the fabulous blog and gorgeous, wearable patterns! I look forward to many more. Thanks for your great patterns! My Citron came out beautifully! Congrats! And to many more years of blog writing for you! Love your blog and love your patterns. I plan to try to knit Citron soon. Congratulations on your blog anni! I´m knitting one of your patterns right now. Love it. Thank you for the opportunity to wine these amazing prizes. Happy Blogiversary! I'm running out now for yarn to start Lilas! Happy Anniversary! I really enjoy your blog, and I love your patterns. I am just finishing Candlestick for my newphew...and getting ready to cast on Trina for me!! I have been enjoying your blog for the past 6 months or so and love looking at all your gorgeous knitting! Wow - what a milestone indeed! It has been so fun to watch you grow as a knitter - I mean DESIGNER:) Congratulations! that's a lot of blogging.. congratulations! Congratulations on your blog's anniversary! I love your blog-your patterns are beautiful. I haven't knit any of them yet but am looking forward to going so. Congratulations on the blogiversary, and on the 200th post! I found your blog via Knitty, and I love your patterns! It's always a pleasure to read such interesting blogs like yours! Just recently found your blog, but am currently enjoying knitting Lilas!! A SUPER pattern! Yay, congrats! If I won I would absolutely pick the pattern for your new Lilas cardigan. It's the first thing in a while that has made me really eager to get my life organized and back to knitting! Nice work! Congratulations on such a fine job. I love love seeing the FOs. My goodness, I scrolled down for miles to get to the comment box! You've got a popular contest on your hands. Happy anniversary! I'm so glad to have found your blog. Congratulations on 3 years and 200 posts. Many happy returns! Congratulations on your "two-fer" reasons to celebrate! Isn't it funny how you start to feel like you know people through blogging? I really wasn't expecting that to happen when I started. Congrats on your blogiversary! I love your beautiful designs! Congratulations on your 3 years...hope you have many more! Happy blogiversary! I'm absolutely in love with Lilas and Cloudy Sunday and I can't wait to see what other awesome designs you create. I only recently started reading your blog in the past month. I love your patterns. Your giveaway sounds fantastic! Congrats! Congrats on three years - your designs are gorgeous! I just started Citron and found your blog through it. Your patterns are very elegant. Love them! Congratulations. I just found your blog a few weeks ago (via Babycocktails) and marked it as a favorite right away! Congratulations on your anniversary. I am off to a slow start on my blogging, but will keep trying. Congrats. Today is the first time I've read your blog and I subscribed quickly. Congratulastions to one of my favorite Blogs. Keep it coming!! Congrats! Love reading this blog - keep those beautiful FO's and patterns coming - sooooo much inspiration (and jealousy sparking brilliance) for me! Congratulations on three years and 200 posts! Wow. Congrats many times over. I consider your blog, style, and ability very akin to what I hope to do one day. You're inspiring folks you've never met! what great prizes! congratulations on three years and 200 posts! congrats on 3 years! i love your designs. as soon as i feel ambitious enough to knit a sweater, i have cloudy sunday in mind. I love your designs. I've made Citron and am looking to make Lilas next. Thank you for sharing with the world! Congratulations! You are one of the reasons I became so obsessed with knitting, that I had to learn how. Took my first class last December and have been knitting ever since. Thanks for sharing with us. :) I love your blog. Congratulations! Thanks for the inspiration! Congratulations on (1) your fortitude in blogging for three years and (2) your increasing success and popularity as a knitwear designer. So exciting! I hope you're proud. Yeah!! Congratulations on so many years blogging! I just bought the Lilas pattern and am in the process of deciding if I should use yarn already in stash or support my LYS/second job and buy all new for the project. Need to decide soon since I'm taking it to knit on my birthday trip this weekend! Congratulations on your blogging milestones :) I really enjoy reading your blog and seeing how you are growing as a designer! Your patterns are lovely, and your blog is lovely to read. Congratulations on your blogiversary! I got some really great ideas from this blog, and it is truly one of my favourites knitting blogs! Congratulations on your blogiversary! I feel so blessed to be able to read your blog (and knit your patterns!). Congratulations! Thanks so much for celebrating with a giveaway! Congratulations on your blogiversary! I really enjoy your classical blogging style. Would love to win one of your awesome prizes. Happy bloggiversary! I love your elegant knitting patterns and as a proponent of teaching the classics in school (I had two years of Latin and am so grateful for my opportunity) it is a thrill to see you exposing the rest of the world to Latin and Greek. Congrats on the longevity of your blog! Keep it up and your wonderful designs. Congratulations on 3 years! You're just ahead of me - I've been blogging for a little over 2. Congrats to you! That online shop really IS adorable too!! Tres anni, gratulationis! Nos, lectori, fortunati summus. Patterna tuis bonae res sunt, nam facta summa elegantis. super congratulations on your blogiversary :) what a generous way to ring in the "new year" :) love your blog, hilary! you are so talented! I wish I had found your blog sooner--I've only been reading for a couple months, but I just love what you do here! Now that school's out for summer (3 cheers for academia!) I'll have to go back and read from the beginning. Congratulations. I'm glad to have found your blog and I'm really enjoying reading it! Fantastic blog, beautiful knitting. Love your clean lines. Bought the Lilas Cardigan pattern and just received my yarn. I look forward to starting it! I stumbled upon your blog when I was researching the Citron pattern. You must never sleep - how do you knit such beautiful items and work full time, plus write patterns and blog? You are an inspiration as I started knitting 6 month ago. congrats on your blogiversary! i really love reading your blog! Hi! I've been lurking on your blog and admiring your work since I began knitting last November. You are very talented, and I can't wait to knit Cloudy Sunday for my second sweater ever. You have inspired me to improve my skills and one day, I hope to design as well as you do. I just discovered your blog a couple weeks ago and have been reading backward through the entries... I'm in awe of your creativity and totally jealous that you work at NASA! I found your blog through Canaryknits and though I've seen some of your patterns before, I had no idea you had so many to choose from. I really love how classic, yet with just the right touch of oomph the new designs are. I found your blog pretty recently but I am really enjoying all your lovely patterns! I just bought yarn for the Lilas Cardigan today! Congrats on your blogiversary...I stumbled on your blog a month or so ago and am so glad I did. I love your work. Congratulations on your blogging milestones! I've only frequented your blog for a few months, but you're so creative I can't help checking in to see what's new! Considering how many of your patterns I'm instantly drawn to (Lilas and Trina top the list at the moment), I can't believe I didn't find your space earlier in your 3 year history (and I have to thank Thea for directing me here a couple weeks ago via a link to Lilas). Better late than never...Happy 3-year blogiversary! So glad I started reading knitting blogs and found you. Always excited to see what you will come out with next! Look at you all popular! And to think, I knew you waaaaaay back when, when Grams was trying so hard to teach us to knit. So glad one of us succeeded. :) Your work is stunning and I am so happy that you are kind enough to share it with the rest of us! Much love. Thank you for your gorgeous knits and photos! Yours makes me glad the world has blogs. I visit your blog often for knitting inspiration and motivation. Happy blogiversary! Congratulations on your blogiversary! You are one talented designer and blogger. Happy blogiversary! You have a lot of talent! Great patterns! Thanks for sharing it with us. It is very inspiring. Great contest too! I love love love your site! Thanks for all the beautiful patterns. Sounds like a lot of tired fingers to me, but I love reading all you write. Congratulations on a new year beginning! I always enjoy seeing what you've been up to, and you've inspired me to get my "rear in gear" to submit some ideas to KnitPicks IDP. Hope the coming year is even better for you. Congrats on the blogiversary! Can't wait for more posts from you. Ok. I'm a lurker, too. But now that I've come out, I have to say I sure enjoy reading, so happy blogiversary. Just discovered your blog and immediately downloaded Lilas and then went to Knit Picks to order the yarn. Love it and can't wait to knit it. Congratulations, and thank you for hosting a contest-- yummy and generous prizes! I have enjoyed reading your blog immensely and would love to win your drawing! Posting at the last minute for your fun contest & hoping relatives get special consideration! I've ordered the yarn to knit Gemma & can't wait to get started. Duh, make me the above anonymous. Happy Blogiversary! I've had such fun knitting Citron for a silent auction gift that I'm ready to starting knitting one for myself! Thank you for the wonderful patterns, lovely picture, and engaging writing!